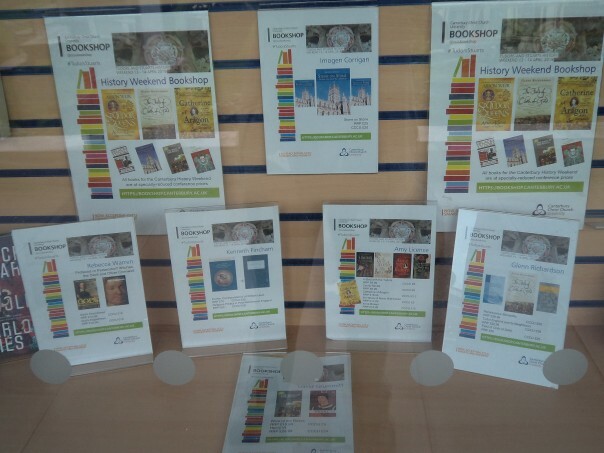 This all-day event, on Saturday 23 March 2019, will celebrate William Somner, who died in 1669, by showcasing his work and times in 17th-century Canterbury. Our speakers include Professors Kenneth Fincham (University of Kent) and Jackie Eales (CCCU), as well as doctoral students at Kent and the University of Glasgow, Avril Leach and Rachel Fletcher respectively. I’m sure it will be fascinating day, so please do have a look at the webpage. Turning to more immediate events, Dr David Hitchcock and I will be leading a walk this coming Tuesday as part of the ‘Being Human’ Festival from the Westgate Towers in Canterbury down through the city and stopping to talk at a few places on the way to the 19th-century prison in Longport, now owned by CCCU. This will give us a chance to talk about ‘endings’ in relation to those viewed as criminals, traitors and malefactors more generally by the different authorities across time. The event will also include the singing of ballads to demonstrate the value of sources that shine a light on popular culture from the early modern period onwards. After the walk there will be a workshop event at the prison itself involving creative writing, and then the action moves to Folkestone before the final event at Margate on Thursday. 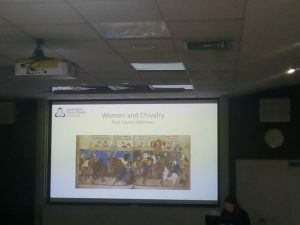 Last week was even busier because as well as the ‘Exploring Kentish Naming Practices’ conference yesterday – more on that anon, on Wednesday the Kent History Postgraduate group had met in the morning, and then in the evening Professor Louise Wilkinson had spoken on ‘Women and Chivalry’ at the Canterbury Historical and Archaeological Society meeting, while at the University of Kent Professor Catherine Richardson had given her inaugural professorial lecture on ‘‘Local things for local people?’- Provincialism, Cultural Value, Shakespeare’. 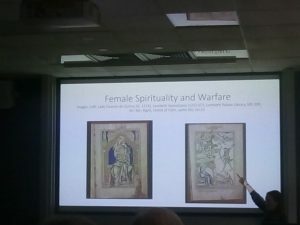 I went to this lecture, but Dr Harriet Kersey was at Louise’s talk and she has kindly provided a summary – see below. In addition, Professor Wilkinson gave a lecture the following day in London, which means she, too, has had a very busy time recently. I’m going to keep to the week’s chronology to report on these various events involving people at Canterbury Christ Church and thus will begin with the two presentations by doctoral students. Rebecca Jarvis, who is working on aristocratic women in 13th-century Kent and Lincolnshire, confined her talk to the marriages of heiresses in Kent during this period, using as her examples the Cornhill family and those who held the Barony of Chilham, as well as several knightly families, including the descendants of Roger de Leybourne and his wife Eleanor of Thornham and the Auberville family. As she said, the marriage of heiresses was very much ‘a family affair’ whatever the Church might dictate/intend regarding active consent, such dynastic relationships providing the means whereby younger sons could acquire an interest in property, and the family could extend its territorial influence or consolidate its holdings in a specific area/region. Moreover, those who had succeeded as London merchants, in particular, might see the advantages of ‘marrying land’, something that would continue for hundreds of years among the aristocracy, but also among yeoman families. Rebecca discussed how wards of court might be exploited by guardians regarding their assets, and also their marriage, including instances where the young heiress was married to an illegitimate son of the king. Co-heiresses, too, were discussed, for these women would have shared the family lands, making each a potentially desirable wife, the property passing out of the original family’s grasp. This generated a considerable discussion, and the importance of land and agrarian assets, albeit of those below the aristocracy, was the subject of our second presentation by Janet Clayton. Janet concentrated on the wool trade in north-west Kent, specifically the Hundred of Ruxley, 1200-1350. Drawing on several sources, but especially the detailed 1301 lay subsidy, she discussed the propensity of different types of livestock in the various households, including the almost universal pig, the similarly common nature of each household having a horse and that in total these householders had almost 3,000 sheep. Some individuals had a sizeable number, such as 60 or 100, and if the type of sheep was comparable to Christ Church Priory’s animals on its manor of nearby Orpington, wethers for wool production were a very important part of the agrarian strategy. Janet then explained how she has found links to possible local wool traders and Italian merchants (bankers) for some of her lay large-scale, sheep-owning individuals in Ruxley during the early 14th century, and she is now trying to see if she can find out more regarding these relationships, and the implications of these links respecting how the wool was traded, the routes involved and the effects this had on the local economy. All of which generated further discussion and for both Rebecca and Janet it will be extremely interesting to see how their research develops. This brings me to the final event, yesterday’s conference. I’m going to keep this brief, but it was great to see about ninety people in Old Sessions to hear Dr Paul Cullen as the first speaker and almost all were still there when Paul fielded the final question of the day just before 4.00pm. Although that question has baffled him never having heard of that particular surname before and even more surprising there appear to have been at least three areas in Kent where there were ‘Hogflesh’ families. He would welcome further references if anyone knows more. The first session comprised talks by Paul – on tavern and inn names in Kent that he has collected for the period from 1400 to 1749, and by Dr Barrie Cook – on tokens from 17th-century Kent linked to occupation and locality. Paul has found nothing so far before The Crane at Sandwich from a record dating to 1417. 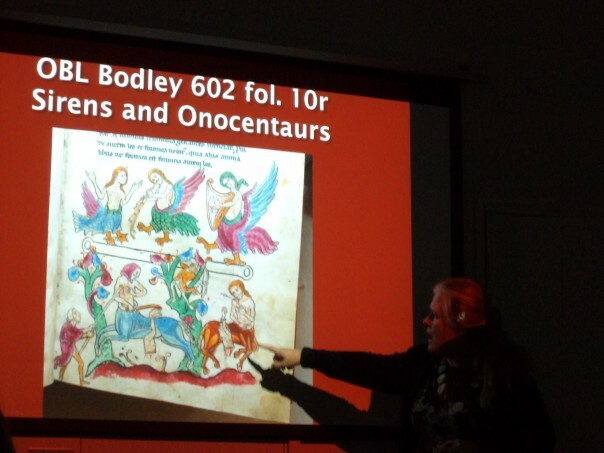 This was an interesting start and allowed Paul to introduce Barrie Cox’s work on such signs nationally who found all his early examples, and indeed many of his later ones, to have strong links to heraldry, which may include religious symbolism (as many things did at this time). The next inn was also in Sandwich: The Swan (1455), but thereafter Paul has references from elsewhere, although in part his chronology is heavily dependent on the dating and type of archival sources – assize and recognisance records, he has so far employed. Again, if anyone has early notices of pub names etc, please do contact Paul because he will be delighted to hear. I have The Katherine Wheel and The Cornish Chough in Westgate/St Dunstan’s, but I need to go back to recover the original spelling for his benefit. Unfortunately, I wasn’t able to hear Barrie’s lecture because I was sorting out a few things before session two, but I heard afterwards that others had found it to be extremely interesting. However, it is worth pointing out that among the towns with the most token issuers, Kent had two towns at number 12, for both Canterbury and Dover had thirty-seven issuers and including these two, the county had eleven towns with over fifteen issuers compared to only one in Sussex. Among these issuers was a Thomas Bullock of The Bull Head, which featured on his farthing. Women, too, are known to have issued tokens, such as Sarah Reade of The Ship in Margate, and John Skinner of Margate similarly had a ship on his halfpenny. Indeed, the variety of the designs is fascinating, and Barrie appears to have shown the audience a wide range from across the county. 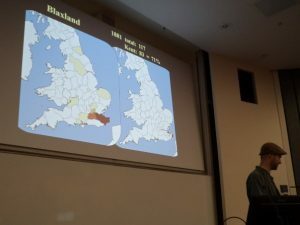 The second session brought two papers from the Kent Archaeological Society’s Place-Name committee, the joint organisers of the conference with the Centre. The first was given by Dr Mark Bateson, the committee’s chairman who offered insights into the skills and working practices of those engaged in place-name research. 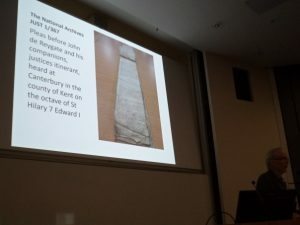 In particular, he showed the audience the document he had worked on while he had been a research assistant at University College London under the supervision of John McNeil Dodgson, a pioneer in the English Place Name Society. Mark highlighted how important it is to record exactly what is in the document, the context of the document – he was working on the justices in eyre rolls, as well as noting the scribal use of abbreviations and contractions. This valuable demonstration of the palaeographer’s craft was followed by Anita Thompson’s exploration of the dens associated with the manor of Lenham from 804 and 850. As noted last week, Anita had kindly stepped in because Margaret Lawrence had had to drop out, and Anita drew on her detailed knowledge of the Staplehurst area and thus where these dens are likely to have been located. Consequently, as well as the dens themselves, she offered ideas about how these autumn pig pastures were used and how the swine herders travelled there from their native areas. Thus, mapping was an important aspect of her presentation. After lunch the third session brought a complementary talk on pigs that looked at the various names given to pigs based on size/age/gender and how, with place-name elements such as pasture or enclosure, the pig was used in various place names in Kent and elsewhere, including the really special Toller Porcorum in Dorset. I then went on to link saints, pigs and place names before exploring briefly the symbolic pig. Dr Ellie Rye, currently at the University of Nottingham but soon to be at York, gave the second talk in this session. 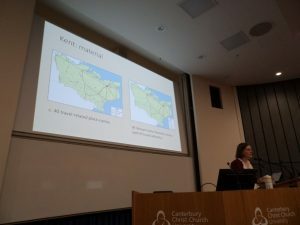 She looked at numerous place names and travel, drawing on the Leverhulme-funded project she had worked on between 2014 and 2017 that had used as its source materials pre-1100 records and civil and ecclesiastical parish names. Kent was among the project’s case studies and she showed the audience how charter boundaries were especially useful whether we are looking at place names or merely named features in the landscape, such as the bishop’s thorn bush. Ellie pointed out that we have far more evidence for this early period regarding east Kent compared to the Weald and western parts of the county more generally. She then examined some examples that demonstrated the existence of a complex system of minor as well as major routes, and the importance of roads compared to river routes, and thus the significance of river crossings whether as fords or bridges. The final session of the day, as I said earlier, was Paul again where he discussed a range of ‘tricky’ Kentish family names. 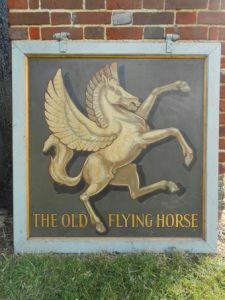 Almost all of these were in some way linked to a place name, and, as well as their derivative, for example Maxsted OE meox ‘dung’ + stede ‘place’, Paul mentioned the first known example and the concentration of the surname as seen in the 1881 census. His talk provoked several questions and some discussion before Mark Bateson and I drew the conference to a close by thanking all the speakers, especially Anita for stepping in at the 11th hour, and the two student helpers: Lily Hawker-Yates who is coming to the end of her doctorate, and Edward Younger, a second-year undergraduate studying medieval and early modern studies. I also mentioned that the Centre’s half of any surplus made from the day will be going to the Ian Coulson Memorial Postgraduate Award fund, and, indeed, Lily has already benefitted from the fund, thereby offering opportunities for her to go to conferences to give papers on her research – a fitting finale to a very successful day.